These are commonly becoming recognized in the immunocompromised patient. This is by far the commonest opportunistic infection, accounting for 80% of the cases of pneumonia in patients with acquired immunodeficiency syndrome (AIDS) particularly when the CD4 lymphocyte count is ::5200/mm3 It is also seen in patients receiving immunosuppressive therapy. In the developing world, however, Pneumocystis carinii pneumonia (PCP) is not infrequently found in malnourished children. It is likely that infection with the organism occurs by inhalation, perhaps in childhood, and the organism may remain latent for many years, being reactivated when immunosuppression occurs. Clinically the pneumonia is associated with a high fever, breathlessness and dry cough. 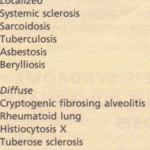 In patients with AIDS, the clinical features are described. TREATMENT is with oral trimethoprim-sulphamethoxazole 120 mg kg:” daily in divided doses or i.v. pentamidine 4 mg kg:” daily. The mortality partly depends on the underlying condition; with treatment it is approximately 25%. 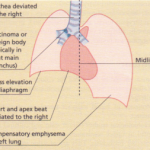 The clinical picture is that of severe pneumonia, lung abscess or empyema. This produces a similar picture to Actinomyces, though of greater severity. 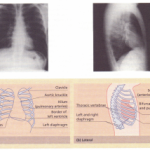 The chest X-ray often shows irregular opacities in one or both lungs, particularly in the midzones. Cytomegalovirus Bronchitis and pneumonia may occur but these are usually a more minor part of the generalized systemic illness. This fungus gives rise to a widespread invasion of lung tissue in patients who are immunocompromised. It is a serious pneumonia that is usually rapidly fatal. Mycobacterium avium intracellulare (MAl) This bacterium causes lung disease in patients with AI DS primarily as part of disseminated disease when CD4 lymphocyte counts are ::s 100/mm3 with the pulmonary complications being of less significance than the extrapulmonary involvement. Therapeutic regimens include combinations of ciprofloxacin, c1ofazimine, rifampicin and ethambutol. Clarithromycin and azithromycin may prove to be particularly efficacious. Infection with this fungus is usually disseminated but pulmonary involvement includes intrathoracic lymph node enlargement and effusions. Intrathoracic involvement usually follows cutaneous manifestations and includes nodules or infiltrates in the lungs with lymph node enlargement and endobronchial lesions. Haemorrhage can accompany any of these lesions. Infiltration with lymphocytes, plasma cells and immunoblasts characterizes this disease which is more common in children than in adults. It is thought to be a viral pneumonia and causes diffuse reticulonodular infiltrates on the chest X-ray. Corticosteroid therapy appears to be of benefit. Pneumonia may be seen in the course of infection by Bordetella pertussis, typhoid and paratyphoid bacillus, brucellosis, leptospirosis and a number of viral infections including measles, chickenpox and glandular fever. It is not usually a major feature. 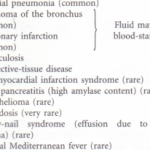 Details of these infections are described. The acute aspiration of gastric contents into the lungs can produce an extremely severe and sometimes fatal illness due to the intense destructiveness of gastric acid-the Mendelson syndrome. It can complicate anaesthesia, particularly during pregnancy. In the absence of a tracheo-oesophageal fistula, aspiration only occurs during periods of impaired consciousness (e.g. during sleep), in reflux oesophagitis or oesophageal stricture, or in bulbar palsy. Because of the bronchial anatomy, the most usual site for spillage is the posterior segment of the right lower lobe. The persistent pneumonia is often due to anaerobes and it may progress to lung abscess or even bronchiectasis. It is vital to identify any underlying problem, since appropriate corrective measures can lead to resolution of the pulmonary problems. This condition is an organizing pneumonia of unknown aetiology although probably not infective. It is characterized by the presence of buds of connective tissue in alveolar ducts and respiratory bronchioles and the absence of any detectable microorganism. Clinical features are a short history of cough and breathlessness with fever, sometimes pleuritic chest pain and a raised ESR, normal white blood count and patchy or confluent shadows bilaterally on the chest X-ray. Finger clubbing is prominent. Lung function tests show a restrictive defect. Diagnosis is important because the disease responds rapidly to corticosteroid treatment. 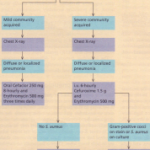 Diffuse pneumonia is very common. It is differentiated from severe bronchitis by signs of bronchial breathing or patchy shadows on the chest X-ray. Widespread diffuse pneumonia is a common terminal event, largely resulting from an inability of patients dying from other conditions (e.g. cancer) to cough up retained secretions, allowing infection to develop throughout the lungs. Treatment in this situation is rarely appropriate. • Mycoplasma antibodies (IgM and IgG)-in acute and convalescent samples. Cold agglutinins present in 50%. • Legionella and Chlamydia antibodies-immunofluorescent tests. • Pneumococcal antigen-counterimmunoelectrophoresis (eIE) of sputum, urine and serum (three to four times more sensitive than sputum or blood cultures). 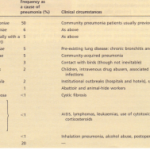 A high percentage of organisms causing pneumonia (e.g. Mycoplasma pneumoniae, H. influenzae and L. pneumophila) will not respond to penicillin or ampicillin/amoxycillin. These drugs should no longer be prescribed and should be replaced by a combination of bactericidal antibiotics that cover the commonest organisms. Treatment is commenced with cefuroxime 750 mg to 1.5 g i.v. 6-hourly together with erythromycin 500 mg i.v. 6-hourly. The purpose of this programme is to treat pneumonia with sufficient doses of appropriate antibiotics at the earliest stage. The treatment can always be modified and reduced in the light of clinical progress and subsequent bacteriological and serological findings. The chances of identifying a causative organism are greatly decreased in individuals who have received antibiotics in the week prior to their admission to hospital. The overall mortality for pneumonia is currently 5% but for pneumonia due to Staph. aureus it is in excess of 25%. Patients who die from pneumonia usually have not received the appropriate antibiotics in sufficient doses before or during the early stages of hospital admission. Severe community-acquired pneumonia has a high mortality particularly in those over 65 years. The presence of a respiratory rate :2:30 min “, a diastolic blood pressure ::560 mmHg and a blood urea >7 mmol litre ” indicates a poorer prognosis and the need for intensive care. In spite of treatment in the intensive care unit approximately 50% of such patients will die. These include care of the mouth and skin. Fluids should be encouraged, to avoid dehydration. The patient is normally nursed sitting up or in the most comfortable position. Cough should normally be encouraged, but if it is unproductive and distressing, suppressants such as codeine linctus can be given. Physiotherapy is needed to help and encourage the patient to cough. Pleuritic pain may require analgesia, but powerful analgesia (e.g. opiates) should be used with care because they cause respiratory depression. however, since the hypoxia is often due to a physiological shunt, it may make little difference to the hypoxaemia. These should be treated in the same way as severe community- acquired pneumonias once appropriate samples for culture and sensitivities have been taken. Gram-negative bacteria are common and treatment should include i.v. ciprofloxacin or ceftazidime. Immunosuppressed patients may require very high-dose broad-spectrum antibiotics as well as antifungal and antiviral agents. This term is used to describe severe localized suppuration in the lung associated with cavity formation on the chest X-ray, often with the presence of a fluid level, and not due to tuberculosis. Causes of lung abscesses are many, but the commonest is aspiration, particularly amongst alcohol abusers following aspiration pneumonia. Lung abscesses also frequently follow the inhalation of a foreign body into a bronchus and occasionally occur when the bronchus is obstructed by a bronchial carcinoma. Abscesses may develop during the course of specific pneumonias, particularly when the infecting agent is Staph. pyogenes or K. pneumoniae. Septic emboli, usually staphylococci, result in multiple lung abscesses. Infarcted areas of lung may occasionally cavitate and rarely become infected. Amoebic abscesses may occasionally develop in the right lower lobe following transdiaphragmatic spread from an amoebic liver abscess. The clinical features are those of persisting and worsening pneumonia associated with the production of large quantities of sputum, which is often foul-smelling owing to the growth of anaerobic organisms. There is usually a swinging fever. Chronic or subacute lung abscesses follow an inadequately treated pneumonia. Fever, malaise and weight loss occur. The chest signs may be few but clubbing often develops. The patient is often anaemic with a high ESR. Empyema means the presence of pus within the pleural cavity. This usually arises after the rupture of a lung abscess into the pleural space or from bacterial spread from a severe pneumonia. Typically an empyema cavity becomes infected with anaerobic organisms and the patient is severely ill with a high fever and a neutrophil granulocytosis. Bacteriological investigation of lung abscess and empyema is best conducted on specimens obtained by transtracheal aspiration, bronchoscopy or percutaneous transthoracic aspiration. Although anaerobic organisms are found in up to 70% of lung abscesses and empyemas, there is usually a mixed flora, often with aerobes, particularly Strep. millen. Anaerobic cocci, black-pigmented bacteroids and fusobacteria are the commonest anaerobes found. Antibiotics should be given to cover both aerobic and anaerobic organisms; prolonged courses are often necessary. Treatment should be cefuroxime 1 g i.v. 6-hourly, erythromycin 500 mg i.v. 8-hourly and metronidazole 500 mg i.v. 8-hourly for 5 days, followed by oral cefaclor and metronidazole for a prolonged period depending on bacterial sensitivities. Abscesses occasionally require surgery. Empyemas should be treated by prompt tube drainage or rib resection and drainage of the empyema cavity followed by appropriate antibiotic treatment for up to 6 weeks.